Access to farmland, secure land tenure and farm succession are top challenges for US agriculture. 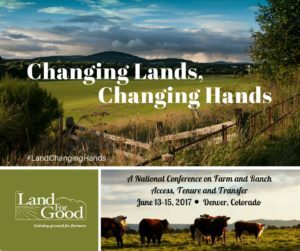 In cooperation with the United States Department of Agriculture (USDA), Land For Good (landforgood.org) is hosting a national conference on farm and ranch access, tenure and transfer. Changing Lands, Changing Hands will be held June 13- 15, 2017 in Denver, Colorado. The conference will bring together practitioners, educators and policymakers from over 37 states and feature a wealth of program and policy experiences, perspectives and innovations from across the country. If you are concerned with or work on issues related to the fate of farms and farmland, farming opportunity and legacy, and the future of American agriculture, you won’t want to miss this conference. Changing Lands, Changing Hands will be cutting-edge with key plenary sessions by national experts on public policy dimensions of land access and transfer, racial equity challenges in agricultural tenure, as well as historic and contemporary perspectives on farm and ranch tenure. Plus 35 interactive conference sessions organized into 6 tracks with roundtable discussion formats designed to share and discuss best and emerging practices, policies and programs. Conference tracks will focus on seekers and land access, succession and transfer, landowners, non-traditional approaches, professional and network development, plus a variety of other key topics of interest. Land For Good, a New England-based non-profit, is a leader in advocating for greater, more secure access to farmland for all farmers, and for keeping working farmland active across the generations. Land For Good’s goal is to advance workable strategies for equitable land access, secure and sustainable tenure, and successful transfer of our farms and ranches. Accessing farmland is a challenge for all farmers and ranchers, but it is particularly daunting for beginning farmers many of whom come from non-farming backgrounds. At the same time, aging farmers, many of whom lack identified successors, face the challenge of passing on their farms to a new generation, whether they be related or unrelated successors. Land For Good has helped hundreds of farmers and farm families find innovative solutions that keep their farms in farming and provide a meaningful legacy. Founded and based in Keene, NH, Land For Good works throughout New England to help farmers access and transfer farms and farmland. LFG reaches beyond New England to lead and work on projects of national scope and significance. They are leaders in a broad network of groups that are tackling farmland access, transfer and tenure issues across the country. Registration deadline is May 26, 2017. For more information or to register for the conference, go to landforgood.org/conference or call Land For Good at 603-357-1600.